Get out of town with these interesting Las Vegas side-trips: Clark County Heritage Museum (in Henderson), Boulder City (Boulder City/Hoover Dam Museum & Hoover Dam) and Overton (Valley of Fire State Park & Atlatl Rock). 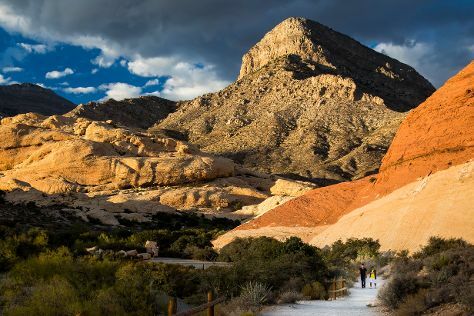 There's still lots to do: explore the stunning scenery at Red Rock Canyon National Conservation Area, enjoy breathtaking views from Eiffel Tower Viewing Deck, admire the natural beauty at Bellagio Conservatory & Botanical Gardens, and examine the collection at The Mob Museum. To see reviews, where to stay, other places to visit, and other tourist information, go to the Las Vegas vacation planner . If you are flying in from United States, the closest major airports are McCarran International Airport and Laughlin Bullhead International Airport. In February, plan for daily highs up to 65°F, and evening lows to 45°F. Cap off your sightseeing on the 24th (Sun) early enough to travel to Ahmedabad. You'll find plenty of places to visit near Ahmedabad: Anand (Jitodia Vaijnath Mahadev Temple & Sardar Patel Trust), Kheda (Shree Ranchhodray Ji Mandir, Vadtal, & more) and Gandhinagar (Capital Complex, Indroda Nature Park, & more). There's much more to do: contemplate the long history of Sabarmati Ashram / Mahatma Gandhi's Home, take in the spiritual surroundings of Jami Masjid, test your problem-solving skills at popular escape rooms, and take a leisurely stroll along Sabarmati Riverfront. To see photos, where to stay, other places to visit, and more tourist information, read our Ahmedabad trip itinerary builder website . Getting from Las Vegas to Ahmedabad by flight takes about 26 hours. The time zone difference moving from Pacific Standard Time to India Standard Time is 13 hours. Traveling from Las Vegas in February, you will find days in Ahmedabad are warmer (88°F), and nights are somewhat warmer (60°F). On the 7th (Thu), you'll have the morning to explore before heading back home.